Right, so I thought I should run over my Adeptus Mechanicus War Convocation list one more time to make sure I don't forget (I forgot a lot of my upgrades in my last game! Conversion fields for my Sicarians! Phase Taser for my Infilitrators! My goodness!!!!). Make sure I don't forget the Infoslave skull and digital weapons! Argh. Anyway, while we're at it, I've gotten boxes so that my display doesn't look so untidy. The full military might of the Draconis system! 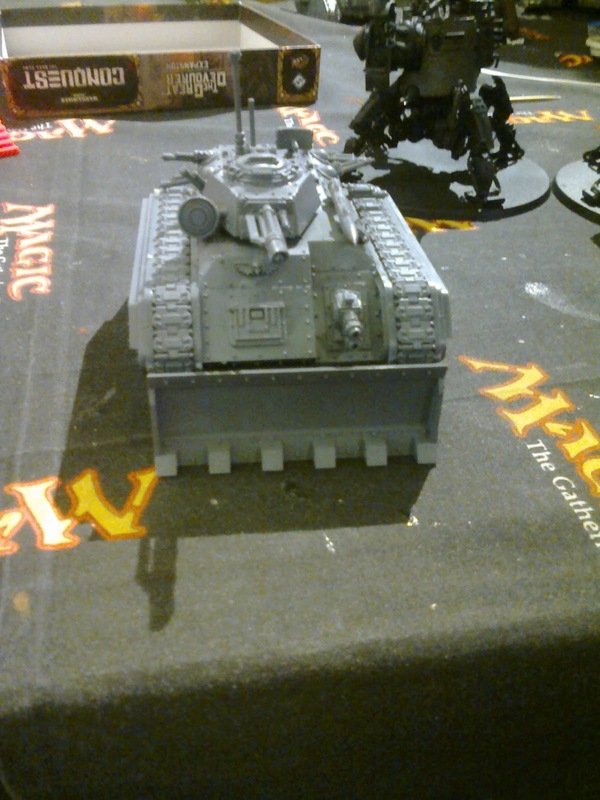 While at it, I secured myself a Chimera, both so that I can use its box to stack even more models, and to complete my Imperial Guard army. I've decided to get 2 Chimeras instead of a Valkyrie. With 3 Wyvern suppression tanks, I think I have more than enough anti-infantry. Instead I'll probably use my Knight Warden instead of my Knight Crusader and throw in 3 Armored Sentinels with multi-lasers instead. 3 shots of S6 AP6 per model might be cool, even if they are only BS3. Additionally they'll be useful in screening my tanks and Knight, particularly by tying up the dangerous assault units in melee. Yay. I have no idea when the Wyverns will come, so I'll just keep plugging away and get a 2nd Chimera or a few more games with my new Adeptus Mechanicus War Convocation. The last game revealed some weaknesses in my list and I'm eager to correct them. I have thought about it further and think I could probably take out one Onager Dunecrawler and leave the other 2 as Icarus arrays. The weakness was anti-air, with that single Stormfang basically blitzing my poor Mechanicus forces into oblivion. With no clear way to take it out, I had best get anti-air. But 3 Onager Dunecrawlers with Icarus Array might be overkill and snap-shots at land troops are a little...sigh. Well, they are awesome in melee, with the Cognis Manipulator. Ha ha ha! I might consider swapping out a 2nd team of Kataphron Destroyers for a team of Kataphron Breachers instead, throw out the extra Ranger and 3rd Onaager Dunecrawler and replace them with a single Kastelan Robot. The Kastelan Robots proved incredibly resilient in the last game, and their heavy phosphor blasts were devastating. I can't wait to see what I can do with 3 of them on the table. We shall see. 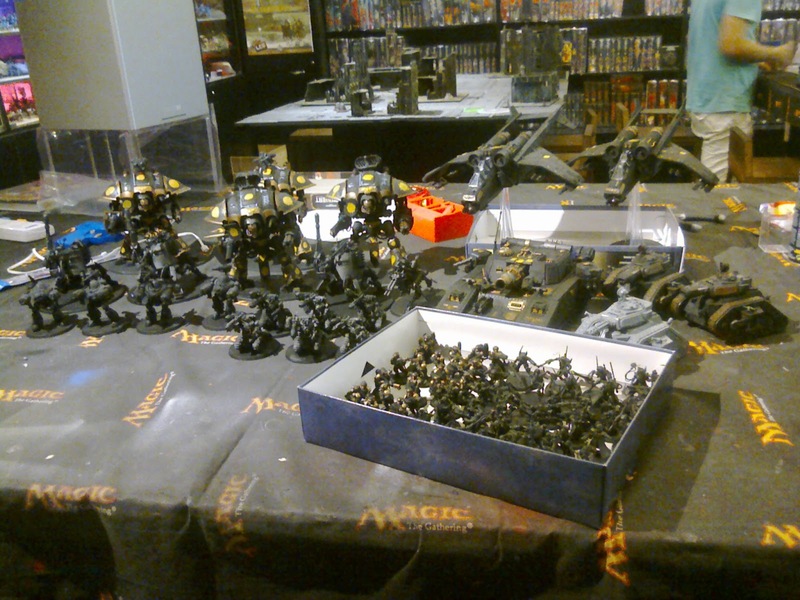 For now, I'll look to finishing my Imperial Guard army and proceeding with my Adeptus Mechanicus War Convocation. For the Emperor...I mean the Omnissiah! As for books, a friend just gave me the first volume of Gaunt's Ghosts, the Founding, and I'm well on my way to completing Lords of Mars. I'll keep my promise to finish the Adeptus Mechanicus trilogy first (I can't put them down in any case) and review them before starting on Gaunt's Ghosts. Besides, I'll read Ciaphas Cain's The Emperor's Finest and Baneblade before that anyway.